This year, we reached out to a group of new and inspiring designers, along with our known fashion designers. And also, as this is our premier fashion week, we are making sure to offer shows when you want to see them, on the weekends ONLY. This season promises to offer something for everyone. Along with collaborative shows, we will be featuring several theme shows and a special show featuring designers participating in the Designers Showcase monthly event..
We are incredibly grateful to our sponsors for supporting us. Our Sponsors include: Ever An’ Angel, JUMO Fashion and Beauty, Lelutka, [ V I T A L I S A N I M A T U M ] Poses, Seychelles Isles. Fashioncentric, Miss SL Magazine, ModelSL Magazine, DesigningSL, Seraphim, Versus Magazine, SL Live Radio,L’Homme Magazine. A Full Service Integrated marketing communications agency serving Second Life’s Fashion and Lifestyle Industries. We assist both emerging and established fashion, accessories, beauty and lifestyle brands their marketing needs. SOLARIS has its own model group of SL’s most experienced and talented models who assist in process of connecting fashion and entertainment with leading Second Life brands. 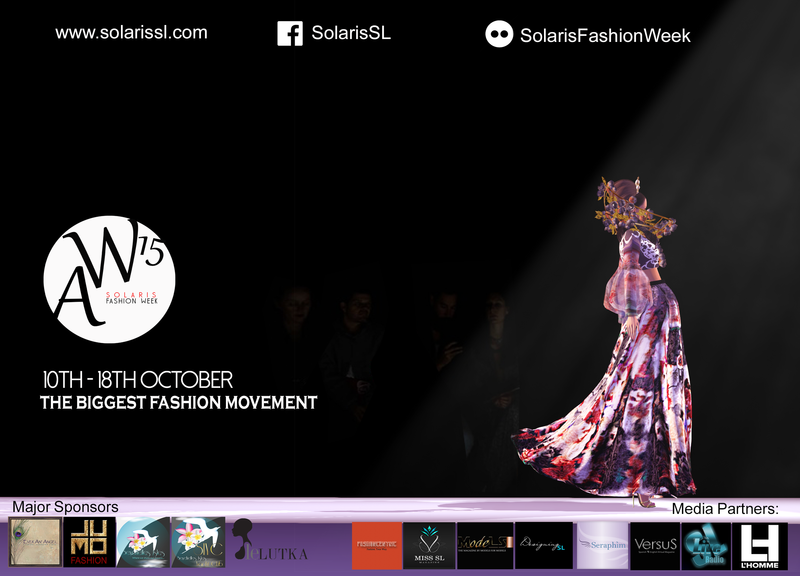 Some of the known and new events to be offered by SOLARIS include: Fashion Week, seasonal fashion presentations, Sneak Peek, a monthly currated fashion shopping experience, monthly Exclusive fashion salons and designer Exclusive runway shows.